Currently Associate Scientist in Preclinical Research at Ethicon, Inc.
During my time at Monmouth University, I encountered numerous professors and students that had a strong positive influence on my personal and professional life. Throughout my course work, I enjoyed my time in lecture, but I felt that without actually applying the knowledge in a lab, I never fully understood all of the principles of the course. It has been over a decade since I graduated from Monmouth University with a Bachelor of Science degree in biology. My passion for science and medicine was evident early in my life and only accelerated as I grew older. During high school, I joined my local first aid squad. Immediately, I enrolled in an Emergency Medical Technician course and began answering first aid calls at all hours of the day and night. I knew that I wanted to expand my knowledge, so I eventually completed a paramedic program and received my Master of Public Health degree. Some of my fondest memories at Monmouth were dissection in Dr. Dorfman’s Vertebrate Zoology course, Anatomy and Physiology with Dr. Mack, and Molecular Cell Biology Lab with Dr. Palladino. Additionally, I had the opportunity to do research projects with Dr. Dorfman and my classmate, who eventually became my wife, Georgiana Sutphen. We seined for fish throughout Monmouth County, took numerous road trips to the Hackettstown Fish Hatchery, and were able to present our research at local conferences. My professional career started at Kelly Scientific Resources as a Scientific Recruiter, and soon I was promoted to a Scientific Account Representative. During that time, I worked heavily on the Johnson & Johnson (J&J) contract finding qualified candidates for open positions in Research and Development at the J&J sites in central New Jersey. Eventually, I formed a large-enough network at Ethicon, Inc. that I was able to find myself a position as a Research and Development Intern within Preclinical Research. Ethicon, Inc. is one of J&J’s oldest and most successful medical device companies, and we are well-known for our surgical sutures. My current role at Ethicon, Inc. is as an Associate Scientist in Preclinical Research. For the past seven years, I have been able to experience many aspects of the surgical device developmental process and contributed to the launch of over a dozen products. 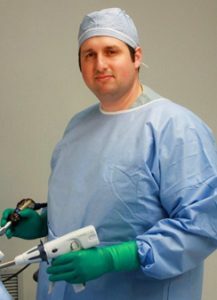 What I enjoy most about my current role is executing surgical research studies; training surgeons on our surgical products; my numerous trips to Monterrey, Mexico, to perform testing on a developmental global endometrial ablation device; and traveling to Brussels and Seoul to perform design validations for our new cardiovascular suture needles. Most recently, I was able to collect efficacy data to support the submission of my first surgical device patent. Georgiana and I still live in the town that we grew up in, and our family has been growing since our marriage in 2008. 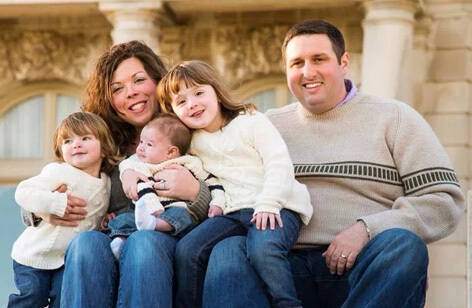 Georgiana and I recently returned to Monmouth University with our daughters, Mariana and Adalyn, and our newborn son, Peter, for family photos at Wilson Hall.